Cryp Trade Capital Review – Popular Hedge Fund or SCAM? Without a doubt, Cryp Trade Capital (cryp.trade) is by far the oddest and weirdest thing that we have seen in a long time. As of recent, crypto currency trading platforms have become very popular. Now, this would all make perfect sense if Cryp Trade Capital was some kind of Bitcoin trading software, but it isn’t. This is no ordinary trading service, and in fact is no trading service at all, which is actually what makes it so odd. Apparently we can give these guys our money and we get a huge ROI on a daily basis. We are going to do a Cryp Trade Capital review right now. The reason for it being that we are totally baffled by what the heck is going on here. Everything about this so called amazing investment opportunity is totally senseless and convoluted. As far as we can tell, it is almost like an insanely high interest account for crypto currency. In case you are unfamiliar with what crypto currency is, it is electronic money that does not exist in any bank, but can still be bought, sold, and traded with. These currencies include ones such as Bitcoin, Ethereum and many others too. Anyway, after you have read what we have to say about Cryp Trade Capital, we guarantee that you will not want to go anywhere near it ever again. 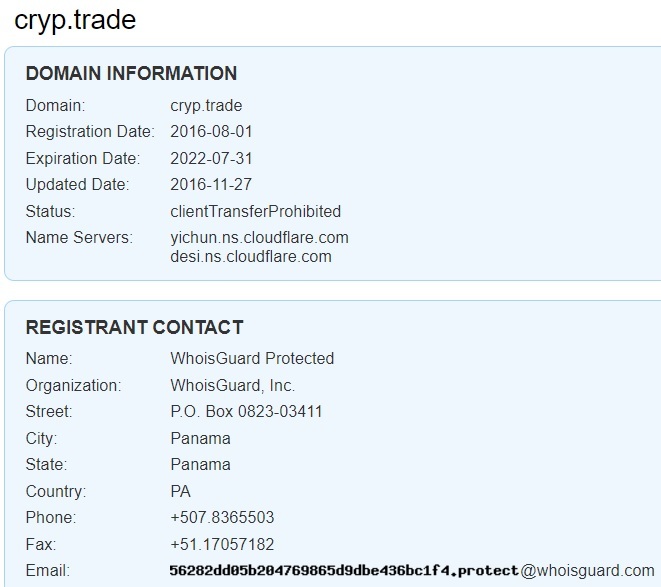 You might even suggest to change its name to Creep Trade Capital :D.
What Is Cryp Trade Capital? That is a really funny question, one that we do not really have a good answer to. It is really weird because there is no product or service being sold here. Usually, crypto currency scams say that they are selling us a service or product, something like a trading platform or at least some advice. However, this is not at all the case here. From what we can gather, this is pretty much a giant hedge fund scam. You are asked to invest money and the people or managers running the show will then invest it for you. Apparently these are group investments from which we then get a certain daily profit. This is indeed pretty weird, especially considering the way that crypto currency works. Crypto currencies are stored on private keys, keys that no one but the owner of the currency has access to, yet these crooks can somehow trade with our currency. This makes no sense to us. Either they will hand over the keys to the currency so it becomes the property of the investor, or they simply use the money you give them in order to buy, sell, and trade crypto currencies. Either way, you can rest assured that you will never get a single penny back. Hedge funds usually don’t work out too well. Just look at the 2011 financial crisis to see what we are talking about. In other words, this is pretty much a giant hedge fund investment scheme, where we willingly hand over our money and then lose it all. Cryp Trade Capital IS A PONZI SCHEME! They use your money to pay out ROI’s to previous investors. The problem is of course that the money never lasts. How Does Cryp Trade Capital Work? Since there is no trading platform here, we are never told how Cryp Trade Capital works to generate cash for us. We are just told that we need to invest money, or more like hand it over, and then we will get a daily return on that investment. Since we are not the ones doing the trading, it seems as though the crooks in charge neglect to tell us what they do. Come on now, if we are giving these guys our cash and trusting them to trade with it, we want to know how they are doing it. This is a big problem in our eyes. Of course, we have gathered that this is like a hedge fund, where we invest money into a big pool controlled by professional managers who then make the trades for us. Sounds really easy, right? Well, this is most likely just a huge Ponzi scheme meant to rip us off. We want to know what the people behind the curtains are doing and what strings they are pulling. Telling us to invest money and then we will get a return on it is not a sufficient explanation in our eyes. These crooks clearly just want us to hand over our hard earned money to them. They never tell us what they do, what strategies are in place, or how they make money for us. Anything we have said here is said due to research and common sense, not because the people behind Cryp Trade Capital were nice enough to tell us. Everything here is just way too secretive for our taste. This is a Ponzi scheme that pays you money from new investors, they use your money to pay old investors, while stealing most of everything that everybody invests. You can be sure that the money will dry up eventually and you will be left with nothing at all! Who Is Behind Cryp Trade Capital? Whenever the creators of something like this, whether it is a Ponzi scheme or HYIP scam, don’t reveal themselves, it is really suspicious. The only reason to not list a company name or the name of the people running the show is to stay anonymous. Anonymity is really nice when the alternative is having your identity revealed and being sent to prison for committing fraudulent actions. What is even more confusing is how there are other review sites out there, like ours, which have listed some Russian or other Eastern European man who goes by the name of Vitaly Ipatov as the owner and creator of Cryp Trade Capital. We would definitely like to know where these guys got their info, because that is something which is not listed on the website itself. Now, it may comes as a surprise after all that we’ve written that Cryp.Trade is a highly popular website and its popularity has been steadily increasing since the beginning of 2017. At the moment, its Alexa.com global rank is 16,656. The site is most popular in Russia, Ukraine, Germany, Vietnam, US, Spain and the UK. According to SimilarWeb, more than 50% of their traffic is referral traffic and the website adbtc.top is responsible for most of it. For those of you who are not familiar with adbtc.top, it’s a platform that allows website owners to offer bitcoins as a payment to people who are willing to view their site. So can Cryp.Trade’s apparent popularity be the result of paying for views? It seems so! The Cryp.Trade site is available in several languages, including English, Turkish, Spanish, German, French, Russian, Japanese, Korean, Chinese, Portuguese and others. So, we have not even covered all of the aspects of Cryp Trade Capital which reveal it to be a scam. In our eyes there is really no need to keep discussing as it is painfully obvious that it is nothing more than a huge Ponzi scheme. If you must know, we also discovered that the website is totally unsecure, which is also true for all email communications. Whenever you email these guys or even just enter info on their website, chances are that someone is going to steal your identity and banking info. Moreover, we also discovered that these guys are totally unregulated and unlicensed. These crooks have absolutely no business handling your money. They are not legally allowed to do so. The glaring reality is that Cryp Trade Capital is a terrible Ponzi scheme. It uses your investment to pay money out to others in order to keep up the illusion that any kind of trading is happening. Yes, this service is technically making small payments right now, but when it comes to Ponzi schemes, the money always runs out. Seriously, these guys expect us to believe that we can make a 0.6% ROI every single day doing nothing at all. This is totally ridiculous. The bottom line is that Cryp Trade Capital is a monumental scheme hell bent on stealing your money. Verdict: Cryp Trade Capital is a SCAM! Have you been scammed by Cryp Trade Capital? Please inform us by commenting below. To join our member list and receive important news from us directly to your inbox, you’re most invited to subscribe! yes conned. asked for money out and then i cannot log in etc , phone numbers do not exist , no answer to e mails etc. En vriendin van mij 25.000 eron gestopt in cryptrade .weet iemand meer ? yes, over $5600 unfortunately ! I sent $50 which 621 blockchain members said was paid, but the site claims to have cancelled the transaction. The online help, doesn’t appear to be staffed. The admin doesn’t respond. It’s pretty obvious that this is in fact a scam. Run from it. Yes I put $$ in. I put some money in.. took some out succesfully and put some more in. Money Im willing to lose.